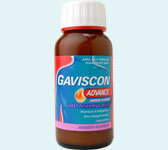 Our office has received a number of inquiries on where one can purchase Gaviscon Advance made by Reckitt Benckiser (not available in the US which only carries the plain Gaviscon without the "advance"). This product, sold in the United Kingdom, is only available through online pharmacies. Amazon.com occasionally will have some in stock as well. Please note that this information is provided for patient convenience. Our office does not vouch for nor has confirmed the legitimacy of these online pharmacies. Purchase at your own risk!